Unless they have a rare genetic alteration, patients with metastatic colorectal cancer (mCRC) should be treated with a chemotherapy backbone and a biologic agent in the frontline setting, said Amit Mahipal, MBBS. 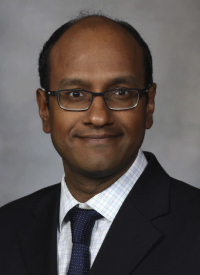 Most patients in the United States will receive FOLFOX with either the VEGF inhibitor bevacizumab (Avastin) or an EGFR-targeted monoclonal antibody, typically cetuximab (Erbitux) or panitumumab (Vectibix), said Mahipal, a professor of medicine at the Mayo Clinic. Moreover, highly effective targeted therapies are emerging for biomarkers such as BRAF, HER2, RAS, and NTRK. For the rare subset of patients with microsatellite instability high (MSI-H) tumors, immunotherapy both as a single agent and in combination has become a reasonable treatment option and there are ongoing trials attempting to expand the reach of this approach in mCRC. In an interview during the 2019 OncLive® State of the Science Summit™ on Gastrointestinal Malignancies, Mahipal discussed navigating the complex treatment paradigm of mCRC and shed light on how recent advances are impacting the outlook of those affected by the disease. OncLive: How has the treatment of patients with mCRC changed in recent years? Mahipal: Treatment has changed a lot over the last 10 years or so. Right now, we use a chemotherapy backbone with a biologic agent. In terms of the chemotherapy backbone, it is usually FOLFOX. For some select patients, we use single-agent fluoropyrimidine or more aggressive chemotherapy. The biologic agent is usually bevacizumab or one of the EGFR-targeted monoclonal antibodies cetuximab or panitumumab. We combine them based on patient factors or tumor-related factors. These factors include age, comorbidities, performance status, and preexisting toxicity. In terms of tumor factors, we are looking at molecular markers that have changed the landscape including RAS, RAF, BRAF, MSI status, and more recently, HER2 status. Is toxicity the biggest factor to consider when determining the right chemotherapy backbone? The main difference [between the chemotherapy agents] is the toxicity; the efficacy is very similar. In the United States, most physicians use FOLFOX as the frontline regimen unless there is preexisting neuropathy. In Europe, an irinotecan-based regimen is much more common. How do you decide between the biologic agents? Anyone with KRAS or RAS mutations should not receive cetuximab- or panitumumab-based therapy, they should probably receive bevacizumab. Some data suggest that [patients with] left-sided tumors may benefit more from EGFR-targeted antibodies. Those are the only patients for whom we consider using those drugs. I would say that the response rates are a little bit higher with EGFR-targeted therapy as opposed to bevacizumab combinations. Which maintenance strategies are being explored in this space? In terms of maintenance therapy, there have been several trials looking at ways to improve the quality of life for patients. [Investigators] have looked into either continuing the same chemotherapy versus downscaling the chemotherapy versus giving a chemotherapy-free interval. Right now, the standard, based on several trials, is to consider single-agent fluoropyrimidine with a biologic agent. Given the aggressive nature of this disease, is there potential to scale back on the chemotherapy that has been given? As a maintenance therapy, we have definitely done this, and we see that it does not affect the overall survival (OS) for the patient. The first progression is probably sooner with the chemotherapy-free interval. When we reinstitute therapy and see second progression, patients tend to have the same outcomes whether we give maintenance therapy or continue the same aggressive regimen. This is especially true with a FOLFOX-based regimen because patients do get neuropathy after about 8 cycles. It becomes more and more difficult to complete this regimen at the full dose. Have any other molecular markers shown promise? We are also looking into HER2, and there are trials with anti-HER2 therapies, especially after progression on first- and second-line treatment. Single-agent HER2 blockade has limited activity, so we are looking at dual combinations. It is becoming more important to do next-generation sequencing (NGS) in all patients with mCRC. Recently, NTRK inhibitors got approved as well. I would advise to do NGS in all patients to reach that precision medicine approach. What ongoing clinical trials are you excited about? It will be interesting to see the data with anti–PD-1 therapy in combination with FOLFOX for frontline treatment. We will see how that pans out. Right now, everyone is looking into immuno-oncology as the next step. There have been trials going on with microbiomes, and we have also been doing vaccine trials as a maintenance therapy. If you could have any area of mCRC get funding for research, where would it be? In mCRC, we have some therapies for specific biomarker subsets, but for the majority of the patients, we still don't have great therapy available. However, we have made advances—median OS is up to 3.5 years from 6 months in the early 2000s. If we can bring immunotherapy to the forefront of treatment, that would change the landscape, as it has changed the outlook for patients with MSI-H tumors.